(CNN) -- Additional evidence found with a man shot to death by police further links him to the shooting deaths of five people in upstate South Carolina, authorities said on Tuesday. Homicide suspect Patrick Tracy Burris, 41, was fatally shot by police in North Carolina on Monday. Reggie Lloyd, director of South Carolina's State Law Enforcement Division, would not elaborate in a conference call with reporters on the items found with 41-year-old Patrick Tracy Burris, but said they appear to have "come from the victims." Burris was shot to death by police early Monday in Dallas, North Carolina. 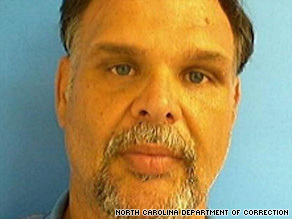 Authorities said they believe he is the man who killed five people in Gaffney, South Carolina, since June 27. Police are attempting to unravel Burris' lengthy criminal history. Lloyd on Tuesday said it raises the question of "what ... the citizens in South Carolina and in this country deserve. And to me, they deserve better than to have somebody with a 25-page rap sheet out on the street with them." Listed as a "habitual felon" in North Carolina corrections records, Burris was released from prison April 29 after serving nearly eight years. His minimum sentence -- on several 2001 felony breaking and entering and larceny convictions -- was seven years and nine months; his maximum was 10 years and a month, said George Dudley, spokesman for the North Carolina Department of Correction. As a condition of Burris' release, he was placed on nine months of supervised parole, Dudley said. After he failed to make his set curfew on several occasions, "numerous attempts were made to contact him," he said. After those attempts, Burris' parole officer concluded he had violated his parole and put the process in motion to revoke it -- a process that ultimately would have landed him back behind bars. It was that warrant, on parole violation, out of Lincoln County, North Carolina, that officers attempted to serve on Burris after finding him and checking his background early Monday. But he shot at authorities, who returned fire, killing him, police said. Dudley said corrections officials feel they did their duty, but were surprised at the Gaffney deaths. "We feel sorry for the people in Gaffney and elsewhere," he said. Burris had six infractions listed on his corrections records during his incarceration, but Dudley said the infractions were nothing "that would have made someone think that he might do what he did." Lloyd, however, said burglary is considered a violent crime in South Carolina, and that Burris' history includes armed robbery. He also has weapons charges "coming out of his ear," he said. "I consider those violent." The federal system punishes habitual criminals much more harshly, he said, and states should follow suit. Although Burris was born in Maryland, he spent many years in Rockingham County, North Carolina, said that county's sheriff, Sam Page. Most of his convictions originated there. Page noted, however, that Burris' record in that county contains only property crimes -- extortion, blackmail, larceny -- and "no real crimes of violence." He recalled investigating an extortion case in which Burris was thought to have forced an elderly man to write a check to him, but said the man was not willing to testify against Burris. Police in Dallas, North Carolina, responding to a call of a possible burglary early Monday encountered three people at a home -- two who lived there and the third who was an acquaintance, said Bill Blanton, sheriff of Cherokee County, South Carolina. They checked Burris' background and found the warrant, triggering the shootout. One officer was shot in the leg, but was treated and released at a hospital. About 100 investigators from North and South Carolina were working the case, Blanton said Monday. Gaffney is in Cherokee County. Peach farmer Kline W. Cash was believed to be the first of Burris' victims, according to police. He was shot to death June 27. Cash's wife found him dead in their home, and the house might also have been robbed, Blanton said. Four days later, the bound and shot bodies of Hazel Linder, 83, and her 50-year-old daughter, Gena Linder Parker, were found in the home where Linder lived alone. Authorities were still attempting to determine whether anything was taken from that home, Blanton told reporters Monday. The last victims were Stephen Tyler, 48, and his 15-year-old daughter, Abby Tyler. Stephen Tyler was pronounced dead at the scene of the shooting last week in the family's furniture and appliance store. His daughter, shot in the same incident, died Saturday. Authorities said on Monday that tests showed the gun found with Burris matched the weapon used in the killings in Gaffney, about 20 miles northeast of Spartanburg, South Carolina, and 55 miles southwest of Charlotte, North Carolina. As for the two people found at the North Carolina home with Burris, "We have nothing to suggest they were potential victims," Lloyd said Tuesday. Authorities are interested in the two, however, regarding their possible association with Burris, he said. Page described Burris as physically intimidating, about 6 feet 7 inches tall and weighing about 300 pounds. "Some people go to prison and learn how to be better and correct themselves," Page said, but Burris apparently did not. "You never know what people are going to do."